Description: This volume addresses two pivotal questions surrounding the composition of 1Maccabees. It sets out to discern the place and function of the torah within the community described by the book. However, before addressing the main problem, the author must first determine the composition history of the text. Given that the former orthodoxy of a unitary authorship seems to be breaking down, and no consensus has taken its place, a literary critical investigation occupies a necessary and lengthy portion of the work. Once a recommendation for the book�s composition history is reached, attitudes toward the inherited Judean tradition are described in each of the strata discovered. The resulting study reveals a wide variety of opinions on the Judean traditions and their function in society. This contributes to the current trend in scholarship of the Hellenistic period questioning the dichotomy between Judaism and Hellenism by demonstrating the different attitudes within even one text. 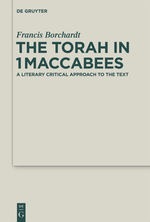 Citation: Thomas Hieke, review of Francis Borchardt, The Torah in 1Maccabees: A Literary Critical Approach to the Text, Review of Biblical Literature [http://www.bookreviews.org] (2015).